The University of Rochester team scanned a Gradient in Refractive Index (GRIN) sheet using Optical Coherence Tomography in order to show the structure of layers that make up the material. The technique allows the internal structure of the optical material to be understood without disturbing the material. Credit: Scientific Reports, Jannick Rolland. The results are published this week in Scientific Reports, a Nature Publishing Group journal. This type of lens, Spherical Gradient in Refractive INdex (S-GRIN), represented a recent breakthrough in lens manufacturing and has many potential applications, including for lightweight single-lens cameras, night-vision goggles and ball lenses for solar collectors. Many animals have eyes that are effectively S-GRINs, which gives them more focusing power, sharper images and a lower number of components. When light passed through a lens, the amount it is bent � or focused � is determined by the lens' shape, and the index of refraction of the lens material. S-GRINs work by having a varying or gradient refractive index. This is known as refractive index gradient. In human eyes this gradient is 0.03. These new lenses have a gradient of over 0.08, which is unusually high, and can help with chromatic aberration, which is when different colors of light focus at different points, leading to a poorly focused image. Jannick Rolland, Brian J. Thompson Professor of Optical Engineering at Rochester's Institute of Optics. Photo by J. Adam Fenster/ University of Rochester. S-GRINs consist of thousands of layers of compressed plastic bent into a lens-type shape. By using OCT, Jannick Rolland, Brian J. Thompson Professor of Optical Engineering at Rochester's Institute of Optics, and her team were able to look at each of these layers individually. They could see all the features of the material down to about one fiftieth of the width of a human hair, obtaining high-resolution 3D images, giving a more precise characterization of how the lens is bending the light. OCT is a powerful imaging tool with multiple applications in the biomedical sciences. But until now, people had struggled to apply it to optical lenses. 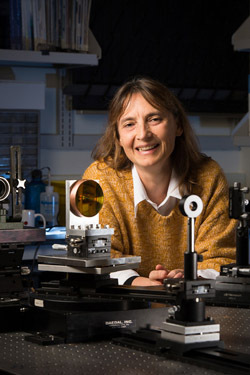 Rolland was confident that her team could tweak the technique to make it possible to visualize the complete structure of these lenses. "I had done the calculation and thought we could do it," she said. "And sure enough, after several months of work we had 3D movies of the whole structure of the lenses and also clear pictures of each of the layers � it was amazing." Rolland and her team are collaborating with Michael Ponting from PolymerPlus, who is developing the manufacturing process for this cutting-edge technology lens, which was invented by Professor Eric Baer at Case Western University. By being able to show the whole lens structure, Rolland and her team were able to pinpoint some areas of the manufacturing process that could be improved. For example, they saw that some of the layers were thicker than the company had hoped for. The feedback that OCT offered allowed S-GRINs to be improved significantly. S-GRINs are made from plastic, which offers many advantages to glass for lenses: it is lighter and more easily deformed into different shapes. Plastic optics have their own challenges however, consistency and high-quality among them. Rolland believes that embedding OCT in the manufacturing process can begin to address these challenges. OCT works by shining light, in this case infrared light (infrared is what humans perceive as heat), onto the lens that is going to be studied. It uses a technique that is similar to ultrasound machines, like the ones used to image the womb during pregnancy. "In the same way that in ultrasound we measure the time of flight to the tissue and back to localize the presence of a structure, we can do this with light that has a much smaller wavelength, which means a much higher resolution," said Rolland. Light is scattered by the different layers of the material so by counting how much time the light takes to come back, it is possible to know how deep into the material it scattered from, and then a picture of the structure can be built. Rolland, Baer and Ponting are all authors on the paper. Other authors in the paper include Panomsak Meemon, Jianing Yao and Kye-Sung Lee from Rochester's Institute of Optics, part of the Hajim School of Engineering and Applied Sciences, and Kevin P. Thomson from the Institute and Synopsis Inc. This work was supported by the Manufacturable Gradient Index Optics program of DARPA and by the NYSTAR Foundation.